We carry a large subset of Vogues huge selection of patterns. Many are designed by wellknown designers such as Donna Karan New York, Issey Miyake, Anne Klein New York, Rachel Comey, Tracy Reese, Rebecca Taylor, Lynn Mizono, Chado Ralph Rucci, Kay Unger, Koos van den Akker and others. Instructions in English and French. Vogue 1511. Half-Placket, Long Sleeve Shirtdress - Rachel Comey. Vogue 1470. Dress, Tom and Linda Platt. Vogue 9192. Wrap-Top Bikini, One-Piece Swimsuits, and Cover-Ups. Vogue 1542. Petite Princess Seamed, Flounced Dress with Shoulder Detail, Patricia Keay. Vogue 1560. Open, Loose Jacket and Slim Pants, Anne Klein. Vogue 9243. 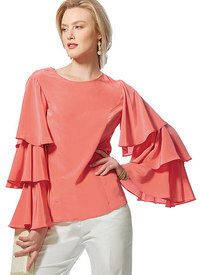 Princess Seam Tops with Flared Sleeve Variations, Vogue Easy Options.